Custom License Plates are always a big hit! Popular at colleges, trade shows, community events and more. Custom combined technologies make the difference! Our exclusive combination of technologies give you a wide range of choices, while at the same time keeping production at it’s highest possible level. No one can give you faster production with higher quality than Fun Fotos To Go! Many of the back end technologies that we use to produce custom license plates faster and better are technologies that no one else has because we developed them in house. On the surface, it may look the same – but it’s not! More choices = more fun! License Plates To Go are an amazingly fun novelty. For many people, it’s the first time they’ve ever been able to get something with their properly spelled name on it! 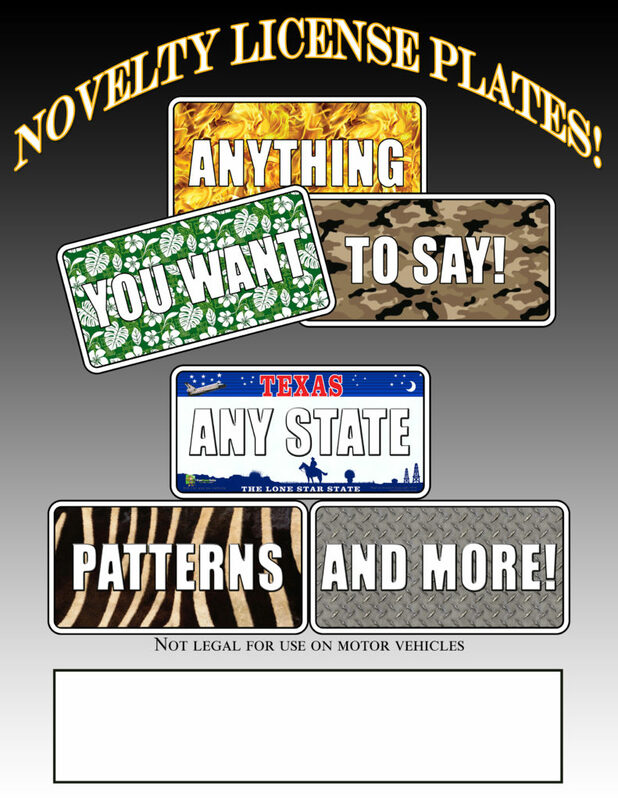 Customization of an event-specific license plate as an option or as the only plate made. Choices of over 50 backgrounds and states. We’ll always make sure we have YOUR state. Pictures from previous License Plates To Go events. Let's get you in this gallery! I am happy to report that everything went great. These guys are so much fun to have on campus and our students had a great time interacting with them. All of you guys are always so awesome to work with and we appreciate all that you do! How many license plates are included? Usually, that number is between 200-240, though it depends on if there is a steady line (there almost always is) or there are rushes. Some of the event photos above are from the Circle of Sisters event in NYC where we used beautiful custom artwork only. Custom license plates are great for corporate branding, the COS event was sponsored by “MajorWorld.com” and NYC’s largest radio station – if guests brought their license plate to the dealership, they got a $500 discount on a car! Tell me about the plates themselves. The license plates we use are 6″x12″, the standard size of a license plate. We can also offer mini size, or motorcycle/bicycle size plates that are 3″x6″ if you prefer. Can I put these on my car? We are not the DMV and these are not intended to be used on your vehicles.